Hey this is an inspired Euope, gazing out over an African coastline. 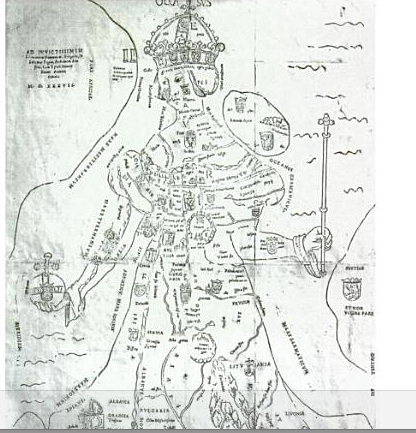 She has a leg of Lithuania, ruled just then by Jagiello of Poland. The umbilicus below Germany is clearly of interest. Hi, I’m a student at Boston College and I am doing a research project on this map. I was wondering where you found your sources? I cannot find anything. Thank you! I sent you an email, and hope it’s useful! Che bello! sent it on to j sheehan. 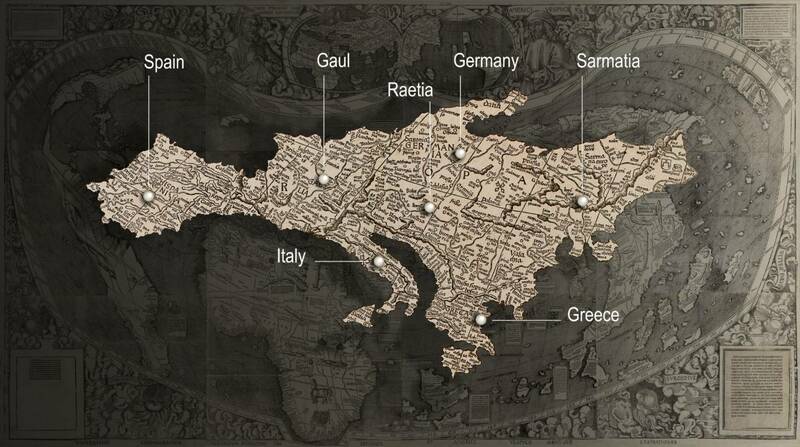 wdn’t you like to do something on my habsburg rose map? Greater realism and accuracy in maps, though perhaps consequences of early modern ostensibly veristic methods, were not necessarily identical to the initial motives impelling the use of such methods. The substitution of self-professed methodological truthfulness for purportedly less accurate means of producing images, maps, texts, scientific models, etc., represents the displacement of mediation towards a low mimetic or “realistic” mode, not for increased realism, but to enhance the credibility of motivating ideologies, by grounding them in the language of apparent factuality, in contradistinction to overt use fantasy and figural language, which were no longer ideologically sufficient. Nice presentation of images! Woodcut by Johannes Putsch is among several possible sources for Queen Europe in influential 1570 title page of Ortelius. A condensed version of article I’m writing on “Exotic Lady Continents” (with some humorous other sources) has just appeared in ENCYCLOPEDIA OF RACE AND RACISM, 2nd edition (Cengage), vol. 2, pp. 140-142. There’s an Ortelius website, as well as a Speed website, at my home page (htttp://faculty.oxy.edu/horowitz). Both Ortelius’ frontispiece and the Bucius’ map are interesting uses of the poetic trope of personification, and elide the forms of mapping with the figure of speech described by Erasmus in _De Copia_. The crowned figure of Europe in the frontispiece to the _Theatrum Orbis Terrarum_ of 1570 personified Europe as the ruler of the entire world, however, and sitting above three other continents. 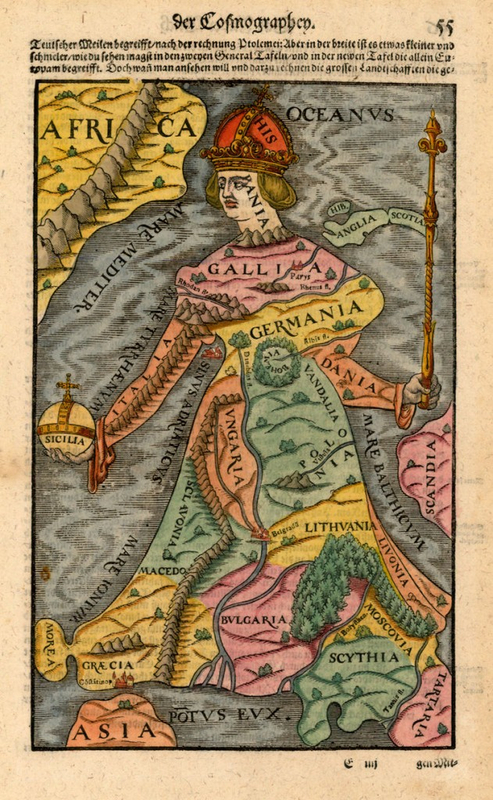 The image interestingly placed Europe beside globes in ways that both suggested she was distinguished by the mastery of the cartographic arts and implicitly that cartography contributed to her pre-eminence. 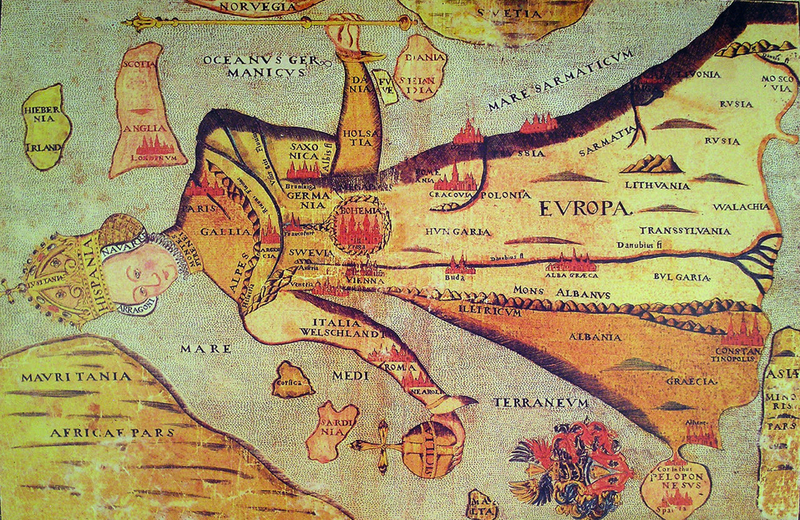 The Bucius map does not suggest Europe’s relation to other continents.